Menus are individually created according to location, produce, and season. And priced accordingly. A wide selection of vibrant, crunchy and colourful vegetables served raw with a smoked, fresh cheese dip. Local cheese served with all the right condiments. Selection of dried and cured meats served with all the right condiments. Crispy flatbreads served with smoked caviar, creme fraiche, red onions and herbs. Venison cooked directly on hot coals. Served with ember baked onions and a honey, butter and mustard glaze. Sardines charred over open flame. Marinated in a sweet and sour pickle. Served with Danish rye bread. 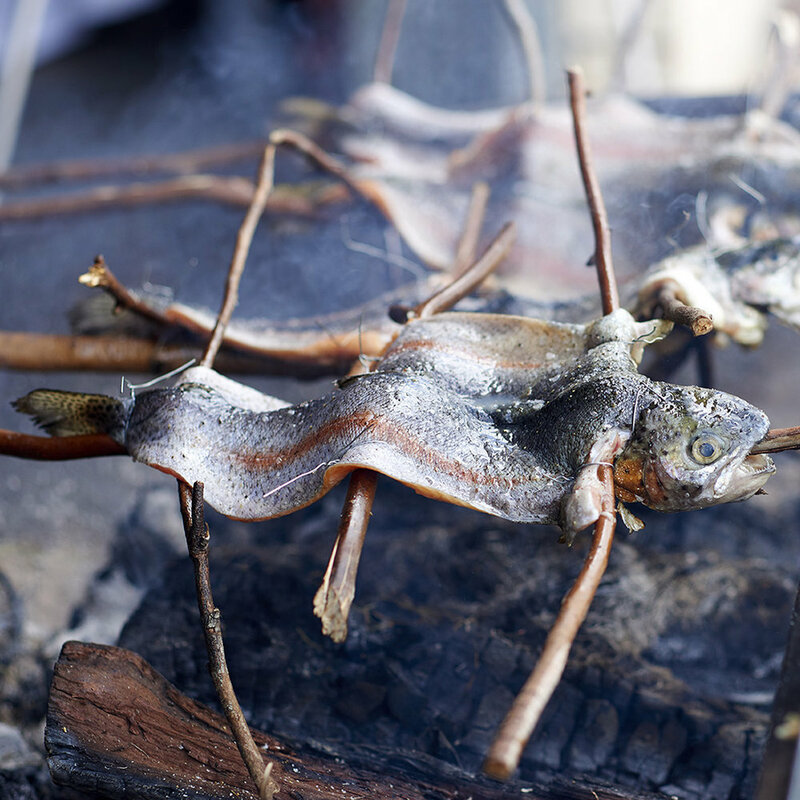 River trout attached to branches and cooked over hot embers, served with fennel salad. Warialda Galloway Beef bone marrow roasted over the fire. Served with parsley, shallots, lettuce leaves and bread. Salmon fillets nailed onto wooden planks and slowly roasted next to the fire. Served with aioli and knækbrød (crisp bread). Honey and soy marinated baby octopus charred over fire. Served with citrus medley and lettuce. Risotto made on pearl barley and parsley pure. Served with potato, mushroom jerky and bonfire bread. Leeks cooked directly in hot embers. Split in half and served with fresh cheese and herbs. 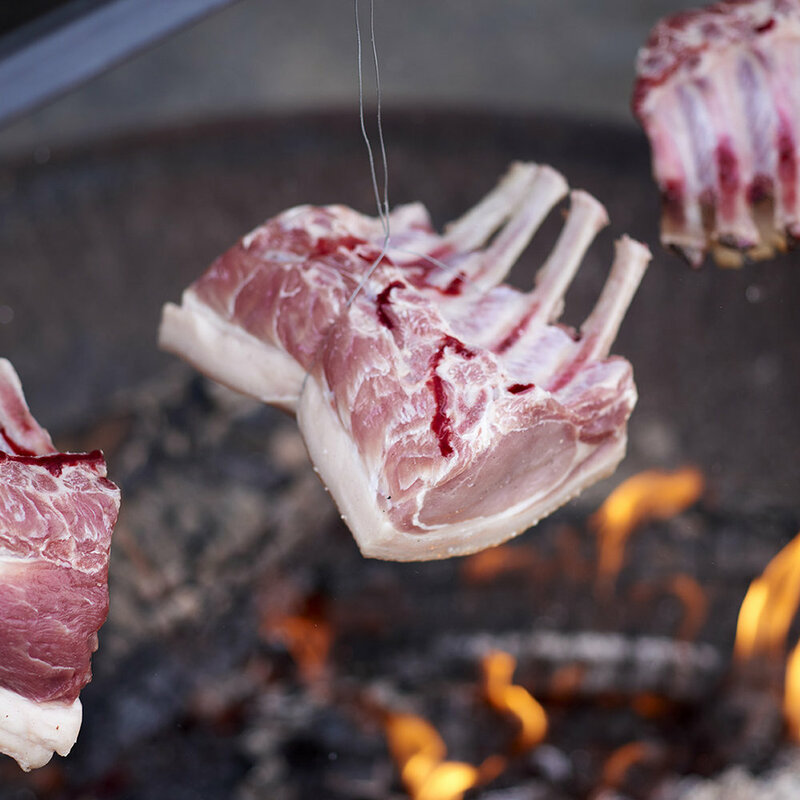 Whole lamb strapped onto a vertical steel bar and cooked for 10-12hrs next to the fire. Served with chimmichurri, seasonal salads and ember roasted vegetables. Whole pig strapped onto a vertical steel bar and cooked for 10-12hrs next to the fire. Served with chimmichurri, seasonal salads and ember roasted vegetables. Free range chickens brined for 24hrs. Then stuffed with lemon and herbs and slow cooked over the fire for 6hrs hanging from a steel frame. Served with chimmichurri, seasonal salads and ember roasted vegetables. Salmon fillets nailed onto wooden planks and slowly roasted next to the fire. Served with seasonal salads and ember roasted vegetables. Whole celeriac hung from a steel frame. Glazed with black pepper molasses and roasted for 3-4hrs over the fire. Served with chimmichurri and seasonal salads. Whole pumpkin slow cooked in hot coals. Carved and served with chimmichurri and seasonal salads. Whole pineapple hung from a steel frame, brushed with caramel and cooked over the fire. Served with rum sabayon and mint sugar. Whole apples baked in ash served with Kentucky bourbon caramel and cookie dough crumbs. Sugared orange cooked on a camp grill served with sabayon and dried rosemary. Selection of berries served with fresh organic cream and shortbread crumbs. Seasonal. Pear roasted next to the fire served with espresso cream and toasted hazelnuts. 3 cheeses melted in a cast iron skillet served with bread.